Niels Wilhelm Gade (1817-1890) contributed some wonderful music to the ballet Et Folkesagn (A Folk Tale), performed so memorably at the Kennedy Center by the Royal Danish Ballet in 2011. Gade's father-in-law, composer J.P.E. Hartmann, composed the fairy music in the second act. Around the same time Gade wrote this dramatic cantata, Elverskud, inspired by the Scandinavian folk ballad Elveskud. The story concerns a young man, Oluf, on the eve of his wedding. Not heeding his mother's warning, he is lured into the Elf-Hill, where the Elf-King's daughter invites him to dance with her. When he refuses to dance with her, she curses him so that he will die the next day. He rides home and dies in his distraught mother's arms. A variation of this story, known in many different versions, inspired Goethe's poem Erlkönig, set so memorably to music by Schubert. Lars Ulrik Mortensen conducts his early music ensemble Concerto Copenhagen in the first recording of this piece in the German translation that Gade conducted many times around the German-speaking world, making him famous. They perform the 1864 expanded orchestration, which Gade used in the performances he conducted but did not incorporate into the published versions of the score. The women's chorus for the elf-maidens is quite wonderful, drawing on the Mendelssohn fairy-music scherzo style, with the Elfking's Daughter sung by the evanescent soprano Sophie Junker, including some satiny, sighing high notes. Mezzo-soprano Ivonne Fuchs is a concerned, matronly Mother, and baritone Johannes Weisser a cloddish Oluf. 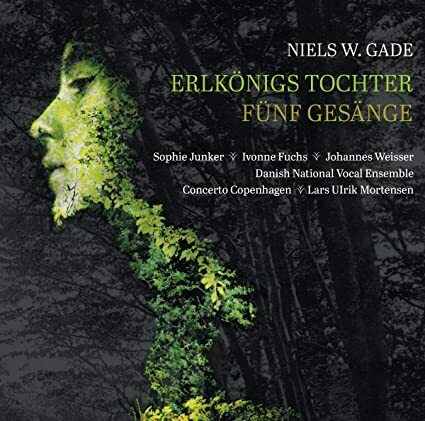 The Danish National Vocal Ensemble sings the extensive choral part, also featured in the less pleasing Five Songs, choral pieces set to German poetry, included on the disc. No texts or translations were printed in the booklet, a major disappointment, crowded out by a fine essay by Niels Bo Foltmann, editor of the Gade Edition, printed in English, Danish, and German. One can, however, download the texts separately. On ClassicsToday: Angel Heart; CD from Hell!